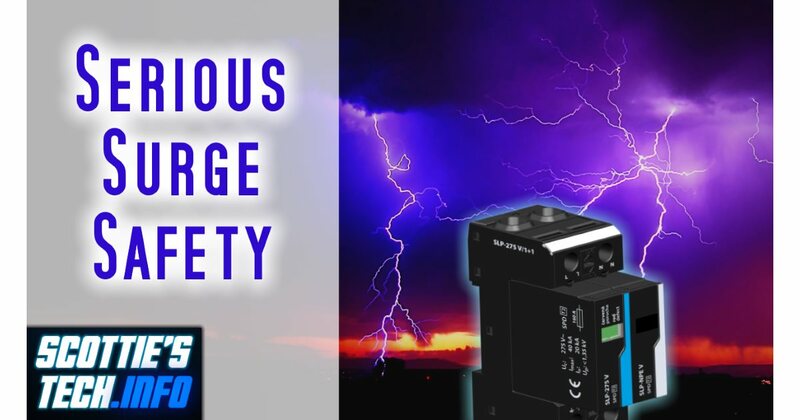 Just be aware that installing one is a tricky business, and it needs to be done correctly to protect fully against surges caused by lightning strikes. Note that you may want to get one of these bad boys even if you don’t live in a “lightning-prone” area. Officially, I live in an area where they are not required – unless you have a lightning rod on your abode. I don’t! 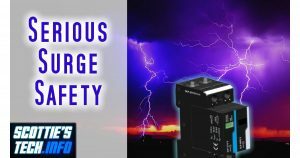 But I noticed that my puter UPS was “ticking” on and off battery power due to overvoltage conditions – especially during storms. So, I installed one of these puppies, and BOOYAH! No more surges, and my battery backup isn’t ticking like crazy any more. Plus, it’s a small price to pay up front to prevent future damage to all my gizmos that would cost a whole lot more to replace! Most protector outlet strips are useless. They come with insurance policy, that is the only protection really provided. So if you can negotiate the lawyers on the on the side of the insurance policy, you may get a settlement. I used to work with a company that specialized in protecting radio tower sites from lighting. In the 20 years I worked there, we never had lightning damage at our tower. We even installed a counter that measured the voltage drop on the tower leg. On a spring weekend, it was not unusual to see 28 counts occur. The idea was to treat lightning entering the building as a pulse, and allow all of the equipment to “float” up with the pulse. And all of the antenna, phone, data, and AC lines would be at that same potential at the equipment. The other rule of thumb ways to remember that lighting never goes UP. 1) The building was surrounded by a very heavy gauge wire, buried a few inches below the ground. 2) Every six feet, or so, a ground rod was CAD-Welded to the wire. This system was referred to as the halo. 3) The base of the tower was bonded to the halo. 4) All of the antenna cables were run through a copper sheet, that had lightning arresters mounted to it. 5) The copper sheet was connected to the tower leg at the same point the cables came off. It was at this place on the tower, that the line to the halo was run from. 6) Inside the building, all of the phone/data lines fed first to a large copper sheet, located next to the AC Mains Breaker Panel ,with lightning protectors. This sheet was connected to the antenna arrestor sheet. 7) Each AC circuit was run through an AC Mains lightning arrestor on the same sheet of copper that the phone/data/lines were on. This sheet was also connected to the AC Mains ground. I think at the bottom of the sheet was another cable that ran through the wall to the halo (just to be sure, see “never goes UP”). 8) Equipment Racks were place on wooden pallets to isolate the from the floor(ground). Each cabinet was bonded back to the same sheet as the AC, phones/data lines..